Measuring cigarette consumption in a population – the average number of cigarettes smokers consume – usually relies on self-reported survey methods. A new study published today in BMC Public Health has revealed some interesting trends and patterns using retail sales data. Dr Mark Robinson and Dr Garth Reid, authors of the study, discuss their study findings in more detail below. Smoking is one of the most important preventable causes of ill-health and premature death in Scotland. There are around 10,000 smoking related deaths every year and it is responsible for around 128,000 annual hospital admissions. If we are to realize our ambition to make Scotland tobacco free by 2034 it is important that tobacco control policies remain a priority. The only way we will know that such policies are successful is to have effective ways of measuring their impact. It is reasonable to conclude that the policies introduced in Scotland over the past 10-15 years have contributed to the decline in smoking prevalence in the country. The problem is that it’s often difficult to show this conclusively. The data used to produce the above chart come from a national self-reported survey, the most common approach to measuring smoking behaviour for decades. These surveys are crucial to our understanding of smoking levels and patterns, how they differ between population subgroups, and how they change over time. However, such methods are prone to a number of biases which can undermine their accuracy. In addition, self-reported survey data can be limited for evaluation purposes as they are usually based on a relatively small sample of the population and are typically reported on an annual basis. Therefore, to better understand the impact of tobacco control, additional methods for measuring smoking are needed. Sales data may offer a more robust and objective approach for estimating population levels of health behaviours. Drawing on our experience of using alcohol sales data for Measuring and Evaluating Scotland’s Alcohol Strategy (MESAS), we decided to obtain cigarette sales data and use this to estimate population cigarette consumption in Scotland, and the rest of Great Britain. We used data on the number of cigarette sticks sold in Scotland and England/Wales from Nielsen. They estimate sales based on cigarette packs scanned at the checkouts of most large retailers across Great Britain and a representative sample of smaller retailers. We looked at the total number of cigarette sticks sold per month between 2008 and 2015 as well as by pack size and retailer type. A number of interesting findings emerged. We found that trends in population cigarette consumption were similar across Great Britain, declining between 2008 and 2013 but then stabilising. A key factor in the downward trend is likely to be rising cigarette prices. And price is also likely to explain the sharp rise in packs containing between 14-19 cigarette sticks from 2014. In response to increases in cigarette duty, manufacturers of cigarettes started to produce smaller packs to maintain certain price points. 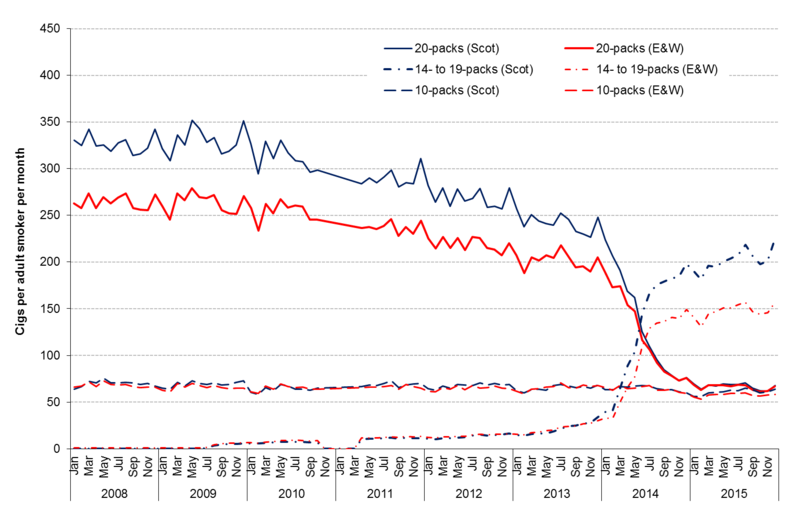 Sales data show a decline in sales of 20-packs and a rise in 14-19 packs. Another key finding was that population cigarette consumption was consistently higher in Scotland than in England/Wales. This was due to higher sales of 20-packs in earlier years, but more recently 14-19 packs. The reasons for this are unclear, but it’s not likely to be due to major differences in the retail or policy environments, which are similar. Differences in historical smoking rates, cultural norms and socioeconomic deprivation are more likely explanations. Like all data sources, cigarette sales data have their own important limitations. In particular, they are vulnerable to a range of biases that affect their validity and reliability. For example, they don’t measure consumption of illicit cigarettes, cross-border purchases or duty free shopping. This means that sales data may provide an underestimation of actual levels of cigarette consumption. It is also not possible to use retail sales data to examine cigarette consumption across different population subgroups – for example comparing lower and higher income groups. Therefore this data cannot be used to evaluate the impact of policy on the persistent inequalities in smoking. It’s also worth noting that the two key results – the trend over time in population cigarette consumption and the higher level of consumption in Scotland – are consistent with self-reported surveys. This begs the question: what is the unique benefit of these sales data for tobacco control monitoring and evaluation? There are several. Sales data are available at frequent time periods, which provides a large number of data points for robust policy evaluation. The breakdowns by pack size are another unique feature and, although not obtained for this study, price information is also available. These features of cigarette retail sales data show their potential usefulness for policy monitoring and evaluation in Scotland and the rest of the Great Britain. Indeed, the data are currently being used by the Tobacco Research Group at the University of Bath to evaluate the impact of standardized packaging. It is our view that the data should be considered, alongside other sources of data, to evaluate any new tobacco control policies that may emerge in the future.